UNSTEADY GROUND IN JAPAN, Canada is Taking a Stand! CLICK POSTER TO BUY TICKETS! For the people of Japan the nightmare continues to unfold, struggling to pick up the pieces of their torn lives, searching for their missing friends, families, loved ones and any piece of identity that remains among the rubble that once was their home. Just when they thought the worst was over Japan was hit with a new 7.4 earthquake Thursday April 7th 2011 issuing another Tsunami warning that was just lifted but Monday April 11th another after shock struck. Total cost of the damage from the March 11th tragedy is estimated at over 300 billion dollars. Not only is the catastrophe the most expensive natural disaster Japan ever had to handle, it is now named as the worlds costliest natural disaster. There is no better time than now to help these people get on their feet and rebuild their country. Canada is taking a stand! Maple Toyota has recently come on board as the Official Sponsor for Canada Rocks 4 Japan benefit concert by wrapping two Toyota vehicles with the CR4J logo. That with over 20 Canadian Artists and Entertainment industry professionals on one stage to donate their time and talent will surely be a ground-breaking event. We have one goal and one goal only, to aid Japan in their time of need. 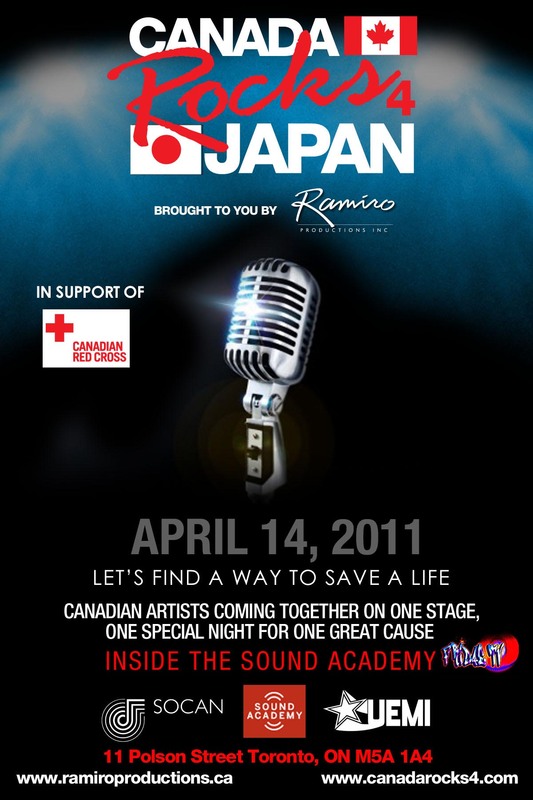 Join us as we unite through music for one night to save thousands of lives.